VISITORS TO MY PHOTOSTREAM will notice a new set of images called "Photos by Mia" and that's exactly what they are. Without any hesitation (or instruction), she's proving able to snap on the go. We owe her some instruction because like me, Mia gets her finger in many of her shots. That happens because the Sony Ericsson Xperia Arc has its camera opening on the side of the phone. It's awkward to hold the phone securely in order to take decent images. But that's not dampening Mia's enthusiasm. She's snapping her world, waist high to her elders. And it's very sweet how she puts her little brother in the frame of many of her images. You can see this unfold if you're in my "family" setting on Flickr. She's working with the images on the iPad, using eBook Creator and also planning to print a small photobook through Snapfish. 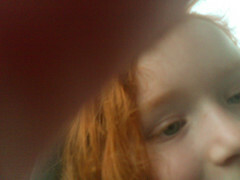 Mia is on assignment with the cameraphone next week, snapping artwork created by her friends in the Pen & Pixel Junior competition. IRELAND'S SLIPSHOD MANNER of attempting to impose a household charge reflects serious deficiencies in the executive scoping skills of the Minister for the Environment. The whole thing is poorly conceptualised. A quick scan of national news items reveals the entire issue is muddled, largely because of shortcomings in how the charge (tax) would be collected. In Ireland, you get a bill presented on paper (or online with an option to print) along with at least three methods to pay (i.e., walk your cash to the Post Office, deduct from a plastic card, or conduct a banking transaction). None of these was possible because nobody knew who was liable to pay their charge. For me, a blow-in who has signed the deeds on two pieces of real estate, it's a little confusing why the Property Registration Authority's records could not be accessed. Both the national office and a local county council have my name and address attached to a piece of property. Once the data protocols are set up, relevant data could be culled, a database set up, and a bill issued. 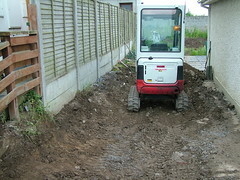 Then homeowners would decide to pay instead of finishing the work around their homes (evidence of our unfinished work in the photo). Instead, the current situtation smells like a bag of soggy chips that were dipped in bad oil, then cooked for too short a time. It feels like a rush job. It discredits the Department of the Environment. And yet, I don't think it's a departmental rush job because only elected politicians are rolled out to explain the process and encourage people to pay. In the meantime, opposition to the charge is much more dominant. I'M USING #mootieuk12 as a hashtag next week and if you're an educator, you might enjoy the flow of tweets. 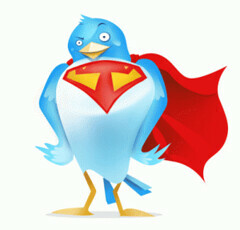 You can get those tweets in your newsreader if you like. Over the past five years, Twitter has cloaked its RSS feeds, perhaps because a lot of Twitter's revenue model is tied to people seeing its front page. This means viewers find it difficult to track high-quality streams of information via their preferred methods. In my case, I like to use mobile newsreaders like Wonder Reader on my Nokia Lumia. The news-catching capability of that mobile reader is more responsive than waiting for a bog-standard mobile Twitter search result. Plus the information stays cached on my phone and that's handy when I'm in a dead zone. I listen to hashtags of industry events and often jump onto the hashtags with my own ideas. Sometimes it looks as though I'm at the event. I've a standard listening post set up for #edchatie (the Monday evening Twitter chat for educators in Ireland) because it spawns interesting information throughout the week. And course hashtags also help keep things orderly for students who don't want the full-on firehose of Twitter sucking down their data credit. IN PREPARATION FOR a short session with DIT's e-learning summer school, I'm unpacking Scrivener so I have a faster method of producing a variety of electronic publications. The $50 program is worth two times its purchase price, not because it works elegantly but because it complements an author's workflow while facilitating several different kinds of outputs. I spent 25 minutes with it running in demo mode and discovered I could correct page breaks and ensure proper paragraph breaks remained intact when saving for iBooks and saving for Kindle. I watched one of the Literature and Latte videos before starting the program, then just set forth with a blank document to pull in my blog posts from my website. That's actually the reverse process than the one I'll start using next week. I plan to start using Scrivener to create my content, for my blog posts, for classroom reading materials and for the novel that's rotting away in the bankers' boxes in the attic. By the end of the week, my new blog posts will have a download button that allows readers to get last week's i-book and Kindle version of my website. And if more than 50 people start doing that, I could have a sponsored channel of content before the end of the summer. SEVERAL TIMES A WEEK, I announce triumphantly that I've saved something to Kindle. It means I'm carrying the information in as clean a format as possible without the need to go online to see what I've downloaded. It feels very empowering to know I can flick through screens that help me revise content, prepare blog posts, and answer questions in my third level classrooms. I enjoy my "send-to-kindle" routine via a bookmarklet that I've installed in Chrome and Internet Explorer. 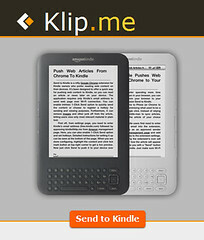 It's a process that hooks my Kindle e-mail address to Klip.me web services for free. If you've a Kindle, I recommend looking at the free service. I'm finding, reading, sending and distilling more content now with this elegant send-to-Kindle service. I'm so happy with its reliability. I AM ACTIVELY seeking spaces where others learn while I also document how I learn from my spaces. Along the way, I'm developing a wishlist that includes high fidelty learning chairs like the one Ulla found in Eero Aarnio's showroom. In an ideal world, we'd furnish the venue for our "Learning Spaces" conference with compelling spaces for teachers to enjoy during the day-long ICT in Education Conference in LIT-Thurles on May 19th. This kind of furniture would help provide working examples of ideal learning spaces that I would cherish. I think we need to pay attention to furniture aesthetics in third level environments, otherwise we're complicit in a process that ensures a factory look to learning environments. We need to foster an environment where learning can be flip on its head, allowing second-hand learning experiences to take their place as first-hand discovery experiences. I think the furniture helps spark creative expression. I GET INSPIRED by third level students and that's what keeps me in the game of education. Today, I'm merely reblogging an item by Eamonn Healy, a student in the creative multimedia programme at the Limerick Institute of Technology. There's a little of Einstein and a little of Edison in Eamonn's post. "When I returned to education in 2009 I recall a conversation that I had with my brother. Having been away from education for over a decade and never having studied at third level I was a little concerned. I remember one of the things he spoke about was self guided learning. He told me that in his experience as a graduate, that the people who done well and got the most from their education were the students who worked beyond what was taught in the classroom. "In the past few weeks I have really noticed how true this is, and listening to a talk given yesterday by a recent graduate from our college, who has now gone to study for a Masters Degree. It has brought it home even more. I have found that most of what the tutors in college have taught is the beginning of my education in the subject, not the cap that makes me a qualified expert. "If there is one thing I have learned from my three years in college, it is that this is only the beginning of my education, and it is up to me to go away with the tools I have been given and further my knowledge. At times this is hard, especially when there are deadlines for assignments looming. Spending four hours trolling through obscure forums, poring over code or watching tutorial videos on YouTube. Often it can feel like time that could have been better spent, but I’m quickly realising research like this is never time wasted. I SPEND A LOT of time inside personal learning spaces that evolve based on available time and space. I don't think any of them feature in Paul Mooney's opinion piece about third level education. In my mind, the biggest thing worth noting is how people involved in teaching adults need to consider how they are upskilling themselves. That's why I take time every day to read what others are saying about learning to learn. It's also why I get a little frustrated when bean counters try to put a metric on everything about learning. So I want to offer some frustration in return. IN 2011, I HEARD Steve Litchfield talk knowingly about Nokia phones with Gorilla Glass and I discovered Corning sharing its vision in “A Day Made of Glass.” I became convinced that glass will shape our everyday lives, just as Minority Report predicted. Today the Gorilla Glass story continues with “A Day Made of Glass 2.” This video is still a day made of glass, but it expands Corning’s glass innovations into a few different places and applications. It definitely affects the world in which my two young children will live, learn and work. Corning set its follow-on video on the same day as the narrative "follows the same futuristic family as they journey through their day, but instead focuses on the father and two daughters. As the characters work, learn, and play, the applications for specialty glass extend into the classroom, hospital, and home of the near future." IF YOU ARE SIX or younger and you like to draw, would you kindly download DrawSomething from the Apple Store and connect to our 4yo via bgoldbach AT yahoo.com? For the past fortnight, Mia has met me at the back door, hoping I have another drawing she can guess. We're playing DrawSomething from OMGPOP (now Zynga) and it's a compelling five star experience. It's also an amazing commercial success story that the software developers in LIT-Tipperary are reviewing for the way it weaves NoSQL in a non-Amazon cloud. We use the app to communicate across the ocean on its whiteboard, to game each other, and to learn our alphabet. At her current rate of exposure, Mia will eclipse her parents' guessing skills. She's already ahead of my drawing skills.